Hello, guys. I’m filling in for Melissa while she spends some time with her family. My name is Olena and I am an author of Clean Eating Recipes blog – iFOODreal. Although I’m not vegan, our family’s meal focus is plant based with meat or fish once per week and limited amount of dairy products. We also strive to eat organic and local as much as we can. As you know, when eating whole foods deli meat is not an option anymore. Frankly, even few natural and organic ones I was able to find do not fit my understanding of eating clean. That is when quick and easy spreads come in handy. 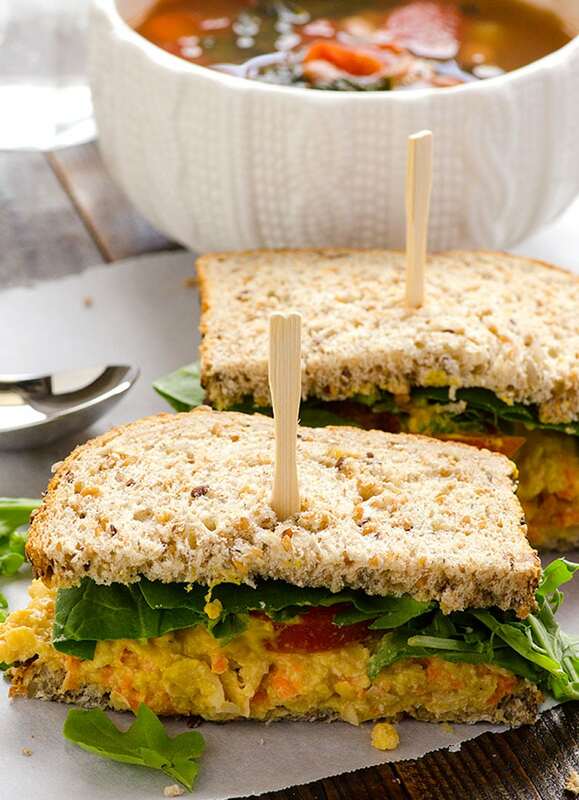 Being fridge friendly for up to a week, this Sesame Chickpea and Carrot spread is perfect to enjoy in a sandwich with a hot bowl of soup for dinner, or quickly spread on a sprouted grain whole wheat tortilla (I like Food for Life) with some greens, roll up and you got yourself a healthy lunch. Fixings possibilities are endless. I particularly like this spread with zesty arugula, juicy tomatoes and a bit of a kick from Tabasco. Just like Melissa, I cook my own beans to avoid BPA in canned beans and not to pay a fortune for those that do not contain BPA. For this recipe, I defrosted a few cans (bags) of chickpeas, quickly mashed with some warm water, added sesame oil and organic tahini, and voila. 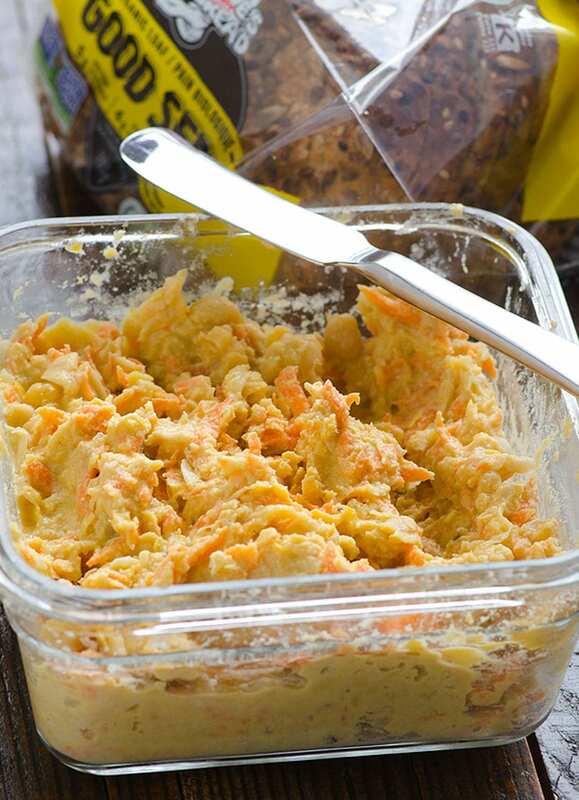 Carrots add a touch of sweetness and a nice crunch. Chia, sunflower or sesame seeds would be great too. I loved no need to dirty a blender. You can add more heat to the spread itself and garlic powder to taste (my recipe is pretty office friendly). My 8 year old liked it but a 4 year old would not go near it. Oh well, will keep trying as this is the age thing. I have included nutritional info with WW Points+ for those who care. Enjoy this vegan and gluten free spread. I never cease to be amazed by plants! In a large bowl, add chickpeas, water, tahini, sesame oil, salt, garlic powder and black pepper; mash with a potato masher until spread of desired consistency forms. I like mine with chunks of chickpeas. Add carrots, mix well and add red pepper flake or Tabasco to taste (I left it out to keep spread kid friendly). 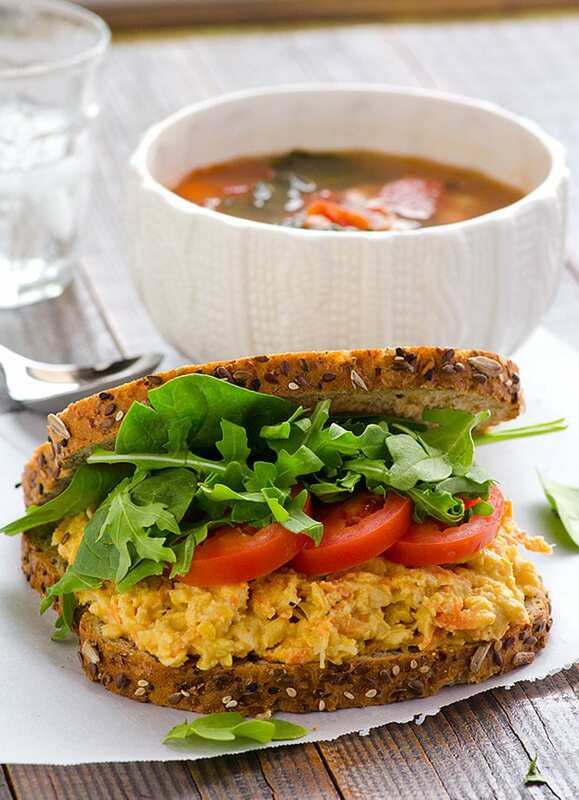 To serve, spread on whole grain bread (toasted) or tortilla, top with a few tomato slices and arugula. Storage Instructions: refrigerate spread in a glass container for up to a week. Notes: *Add less salt if using canned beans. Olena is behind the food blog www.ifoodreal.com. Make sure to check her out. Awesome recipes and beautiful photos! You can also connect with Olena on social media. This looks so awesome- and so much nicer than any 'traditional' sandwich filling!!! Everything looks so delicious! Thank you for sharing these great recipes! I love clean eating and I am always happy to find nice recipes!